When the Sanyo Xacti VPC-HD1 first shipped, it was panned for being lousy at image stabilization. A shaky image is never pleasant to look at, but a shaky HD image is almost enough to make you sick. 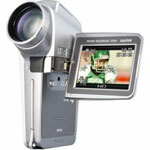 Sanyo made some improvements and recently released the VPC-HD1a. I got to see the the VPC-HD1 and VPC-HD1a side-by-side and compare the image stabilization at the Portable Media Expo. The revisions to the HD1a make it a functional highly portable video camera. The revised Xacti camera still boasts 10x optical zoom, 5.1 megapixel still images, 1280x720 (aka 720p) video resolution and on-the-fly MPEG-4 encoding to allow about 40 minutes of video to fit on a 2GB SD card. While I wouldn't consider a pocket sized camcorder a replacement for many of the larger handheld models, especially for shooting any kind of serious HD video, the Xacti VPC-HD1a shines in an area dramatically underserved in the digital video camera market - portability. By making the improvements to image stabilization, Sanyo is now doing for the digital video market what Canon did for digital still cameras when they launched the Digital Elph line several years back. The Xacti VPC-HD1a leaves you no excuse not to take a video camera with you everywhere. If you plan to only shoot for iPod viewing, there's a mode that automatically records at 320x240. The still images are good enough you could even dump your pocket-sized digital still as well. While the price makes portability a little spendy at $699 (the lowest price I could find as of this writing), it's the most affordable way to dip your toe into HD video and the only way to get HD video in your pocket (at least for now). The next time you see me, you can almost guarantee I'll have one of these in my pocket.